The 10 hour series Crossing Lines to start airing this summer on NBC was selected for the Opening Ceremony of the 53rd edition of the Monte Carlo Television Festival on June 9, 2013. 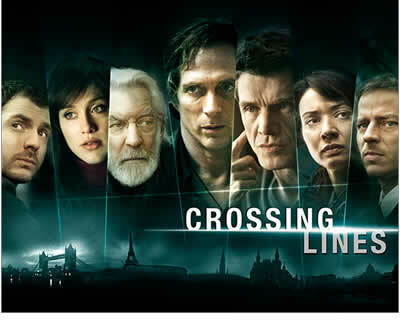 Monaco Mediax Vice President and Festival de Télévision de Monte-Carlo manager Laurent Puons announced Crossing Lines will open the festival and Donald Sutherland that stars in this production will receive an award for his achievements. Puons salutes the creative team behind the project and considers the fresh procedural crime series Crossing Lines a truly iconic global production that is to establish standards for years to come. The Crossing Lines series is centered on the activity of a special investigative unit assigned by the International Criminal Court (ICC) to investigate cross-border crime, catch the criminals operating and hiding in various parts of the world, and bring them to justice. The team of young cops from all over Europe assembled in The Hague under ICC’s directive is joined by US detective Carl Hickman. Together, the highly trained and skilled team must learn to use their abilities as a team and fight criminals just as skilled and intelligent. Besides award winner Donald Sutherland as Michel Dorn, the cast includes William Fichtner as detective Carl Hickman, Tom Wlaschiha, and Richard Flood among others. One of the reasons Crossing Lines is set to open the Monte Carlo Festival may as well be Sutherland’s lifelong achievement in television that is to be awarded during the Opening Ceremony. Donald Sutherland receives the Crystal Nymph Award this year in the Opening Ceremony at Monte Carlo. Tandem Communication (The Pillars of the Earth) and Bernero Productions (Criminal Minds) are behind the new awaited procedural series to make it on NBC’s schedule. NBC starts airing the new series on June 23, 2013.